The shop has closed and phone has been disconnected. See our End of the Roll newsletter. Nate is assuming the duties of player piano restorations. Nate is 28 years old and lives in Anoka, MN. His interest in player pianos started at a young age as he enjoyed the Packard player piano at his family cabin in Sauk Rapids. The piano eventually fell out of service and in 2013, he decided to try his hand at restoring the player system. With some practice, the help of a how-to book and pointers from Don Barton, the results were successful.Nate has been working part time at Barton Player Piano since 2015, learning on the job by assisting with restoration, repairs, and service calls. Nate started his own company that offers player piano rebuilding and repair from his shop in Anoka. 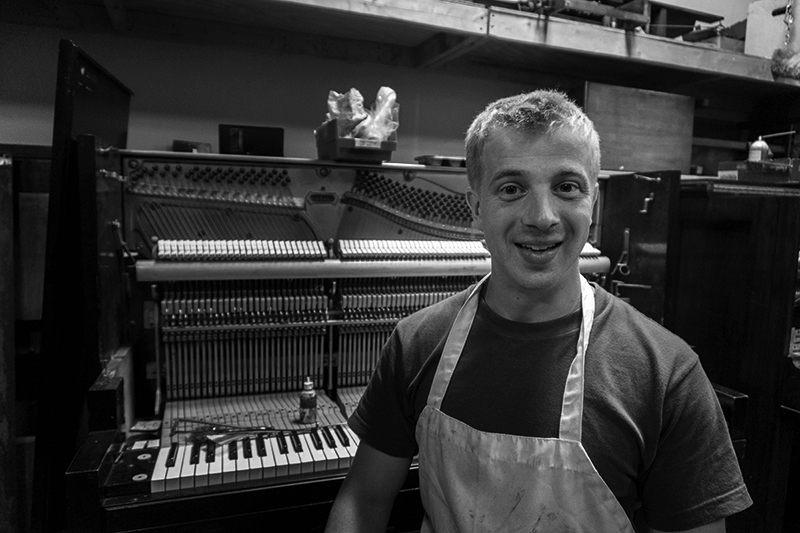 Caleb started in piano sales in 2004; his mechanical talent was recognized by the piano technicians he worked with there, and he began to learn to tune and repair pianos. Fascinated by player pianos, he learned to service modern Disklavier and Pianodisk player pianos during this time as well. Since then Caleb has refined his tuning and repairing skills and is an associate member of the Piano Technicians Guild, where he is the chapter’s newsletter editor. He has become Yamaha’s go-to for modern Disklavier Mark IV/E3 player service in the Midwest and excels in tuning and field repair of older pneumatic player systems. The first player pianos made their debut in America in the late 1890's. Between 1910 and 1925, over 85 percent of all pianos manufactured in America - upright and grand - were player pianos. Many people are surprised to learn that even the finest of pianos, including Chickerings and Steinways, were made with player mechanisms. Reproducing pianos were also made during this time. These are player pianos that not only play the notes, but play back a complete performance, including louds, softs, and crescendos. With a reproducing piano, it is possible to enjoy the complete quality of a piano performance by such artists as Gershwin, Paderewski, and Rubenstein. During the early 1900's, family and social gatherings often centered around the piano. Because such a wide variety of music was available on piano rolls, nearly any desired selection of music could be played. The advent of the phonographs and the radio in the late 1920's soon brought about an end to the player piano's popularity. Now, however, they are again becoming popular. Many are still in existence and are often passed down in families as heirlooms. These pianos can be restored in both sound and appearance to their former condition. Over fifty kinds of player systems in hundreds of different brands of pianos were made, some more common than others. Because some kinds are of better quality and design and lend themselves better to rebuilding, it is best to consult with a professional rebuilder before purchasing a player piano for restoration. 10. Listening to Phantom of the Opera roll ($25) is less expensive than seeing the broadway show. 9. Make the neighbors believe you can play the piano. 8. Playing a piano roll is easier than learning how to play the piano. 7. Keep the kids off the streets. 6. Makes your house the popular party place. 4. Can pretend you're Pavoratti without having to embarrass yourself in front of an accompanist. 3. Better workout than Stairmaster.